On 1 December 2015, the University of Reading will host an Open Day to provide an opportunity for those interested in applying to the AHRC SWW DTP for a PhD studentship to learn more about postgraduate research and training at Reading. It is open to those who were not able to attend the SWW DTP Information Day on the 23 November, as well as to those who wish to visit the University of Reading after that event. • and a tour of related Departments and facilities. Are you a Reading master’s student or final year undergraduate thinking about doing a PhD? Come along to the Graduate School’s ‘A PhD: What, me?’ workshop on Wednesday 18 November 2-4 pm (Arts, Humanities, Social Science, Business) or Wednesday 25 November 2-4 pm (Science/Life Sciences) in Palmer 109. • What is a PhD? If you’d like to attend, please complete the online booking form. If you can’t make the above event, then you can download the Graduate School’s guide to doing a PhD at Reading. Lorenzo Todorow di San Giorgio is a doctoral researcher in the Henley Business School and has recently submitted his doctoral thesis. 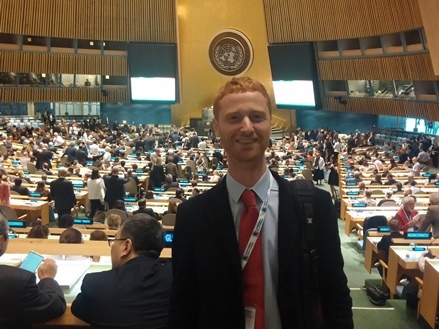 In June 2015, Lorenzo attended the ‘Business for Peace’ 15th anniversary at the UN headquarters in New York as an academic researcher in sustainable business, multi-stakeholder dialogue and stakeholder engagement. “The Business for Peace 15th anniversary was a three-day event in which participants had the chance to exchange ideas on how businesses can strengthen their potential role in fostering peace in war-affected areas. In attendance were CEOs and representatives from multinational companies (e.g. Unilever, Nestle, Pirelli, L’Oreal), representatives of the UN (UN Secretary General Ban Ki-moon, the UN president Mr. Nassir Abdulaziz Al-Nasser, the UN Global Compact Executive Director Georg Kell, the UN deputy-secretay Jan Eliasson) and representatives of important civil and academic institutions. Over the course of the three days, there were several panel-discussions, round-table talks and a number of presentations delivered by key figures within the business and non-business sectors. During the plenary session, I was involved in discussions on the key challenges facing academia in supporting businesses to contribute to peace in conflict-affected areas. I talked about the importance of stakeholder engagement to achieve this important goal. Another group discussion gave me the opportunity to share my ideas and research findings on multi-stakeholder dialogue activities with delegates from a variety of different sectors, but who all see dialogue as one of the main driving forces for business to become a force for good. During the third day we attended an exciting plenary session in the General Assembly Hall, where the UN President, the UN Secretary General, the UN Global Compact and other important representatives of businesses and civil organisations delivered speeches which highlighted the support of the UN to sustainable and responsible business practices around the world.